Just like how our mugs are made using raw materials sourced from reclusive gnomes living deep in the forests of northern Wisconsin and unicorn snot for our rainbow of glaze colors, the sourcing for this coffee will be special. 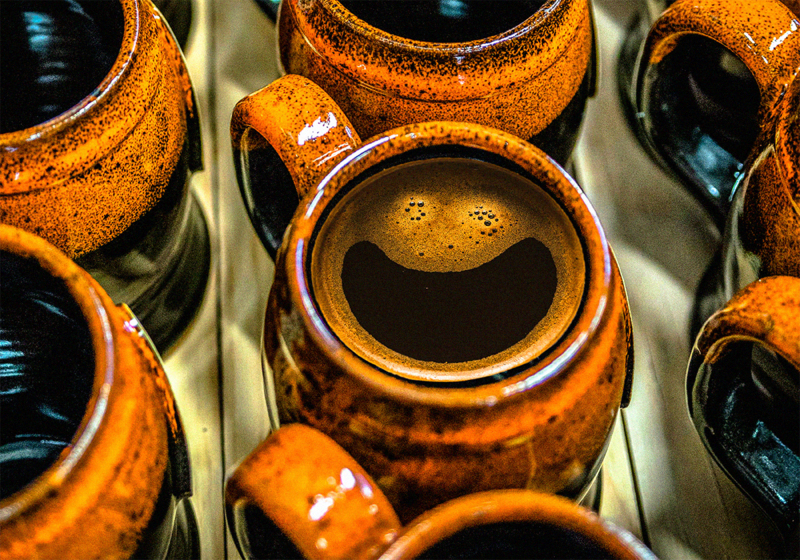 Each bag of limited edition craft-roasted coffee will be filtered using our potters' tears. All tears were shed after making our potters watch a marathon of more than 1,000 episodes of Days of Our Lives during a five-day period. The tears were then barrel-aged for five weeks in the crawlspace below Tom Dunsirn's house to give them a deeper flavor. Our limited-edition coffee beans will be sourced from a man living in the basement of Sunset Hill Stoneware's office, who alleges that he bought them directly from a farmer in Narnia. We don't know how accurate his claims are—but we do know that his coffee tastes good. However, supplies are limited. Our dealer, who bears shocking resemblance to Chris Rand, refuses to give us more until he can find another wardrobe to climb through. Until then, we've only made 12 and a half bags of the stuff. Once they're gone, they're gone for good. Each 12-oz. bag will cost $1,000,000, plus shipping, handling and convenience fees. Sunset Hill Coffee will be available never, as this is a special offer only available for April Fools' Day.